I’m not sure if you would consider me a has-been or a mighta-been, but piano playing used to be a central focus of my life. Nowadays I barely even listen to music. Come to think of it, there is no excuse with all the fabulous technology allowing me to make a play-list with symphonies and worship songs…if I had an iPod. Which I don’t. Gone are the days when we had to lug huge recording collections to the mission field. Last week in Colorado was an interesting contrast in music standards. 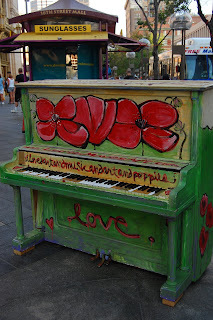 My daughter and I entertained ourselves by playing old pianos along Denver’s 16th Street Mall. All were painted in fun designs, but they were badly out of tune. Not knowing any ragtime pieces by memory, I banged out “Malaguena” (my signature piece back in high school Spanish Club days). A random tourist even videotaped my “performance.” So you never know, someday maybe I’ll become a YouTube sensation. On Sunday I had an opportunity to play the offertory for a church in Buena Vista, overlooking the Rockies. 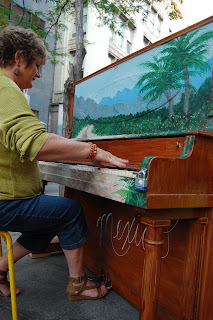 The view was amazing with aspen trees in full color, but the piano was even more beautiful (if that’s possible). After years of honky-tonk sounding instruments, it was a rare privilege to play a well-tuned Kawai baby grand. Anything I played would have sounded lovely. I wasn’t self-conscious in the least, even though I had every reason to be. Instead I just played from the heart. Just as the off-key pianos on the mission field or on 16th Street can’t compare to a Steinway grand, I figure the most awesome symphony on earth cannot compare to the glorious music awaiting us in heaven. Whether I’m a has-been or a coulda-been, one thing is for certain: I “will be” spending eternity making heavenly music for my Savior. IRL* Somewhere between honky-tonk and Steinway Grand, I am finding the notes of contentment again. Lisa, your comment literally made me cry. How well I remember getting my own "baby" back with my first full-size electronic piano, a Casio. How precious to lay something down and be given it back as a blessing, not an idol. (((Lisa))) - a cyber hug for you this morning. Ah, see, I am forcing my poor children to take piano over their moans and groans right now out of a quiet sense of loss that I was never given the chance to learn music having grown up without it. I only hope they grow to love it enough to play spontaneously on the streets! Can't wait for your You Tube premiere. Ellie, do I dare admit that I allowed my daughter to quit piano back when she was about ten? To me music is a privilege, and I couldn't bear to force her to do what should be a joy. After years of quiet tears and prayer, I saw her return to piano by her own choice. 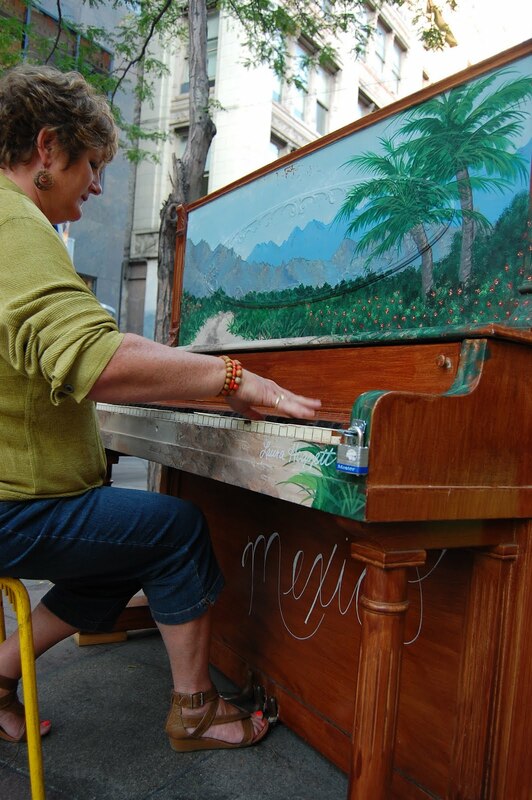 Hearing her play Clair de Lune on a street piano, or any piano, brings a lump to my throat every time. I pray that your children learn to love music! When I first came to Africa, I couldn't come with a piano. I was forced to learn guitar so I could worship. It's in my nature to worship when I play. Now I can lead worship for my fellow missionaries. I have finally been able to get a full-size keyboard and the guitar sits often as I return to my passion, piano. Just wanted to check on you all, with the land slides and all. Praying! May He be glorified and draw many to Him! Thanks! We are safe here, but there is one place where the highway is impassable between our house and the school where our kids attend M-W-F in the city. The worst hit area is a place we have been praying for these past 16 plus years. Just this year we have started recording the Mixe language New Testament for the very people whose village was devastated. Maybe through this crisis God will provide an open door for ministry to this unreached people group. Please do pray! I'm glad you all are ok. Will pray! Hey, you don't happen to have a need for a guy with 20+ years of special ed experience, camp directing, with a servant's heart? Just wondering. Thanks for posting that you are ok.
*LOL = someone just wrote that I put the "L" in LOL! *Methusalah = my husband, Jim. Please refer to this post for further explanation. *Stuff-Mart = generic term for Walmart, K-Mart, etc. *unique challenge = something way worse than it sounds in a prayer letter. *virtual obscurity = little-known. Synonyms I like: hidden, inglorious, invisible, lonesome, nameless, odd :-) , and secluded. Is There Some Hip New Way? Cut and paste to refer people from your blog over to IRL. Thanks! © 2012 Women of the Harvest Ministries International. www.womenoftheharvest.com. Powered by Blogger.